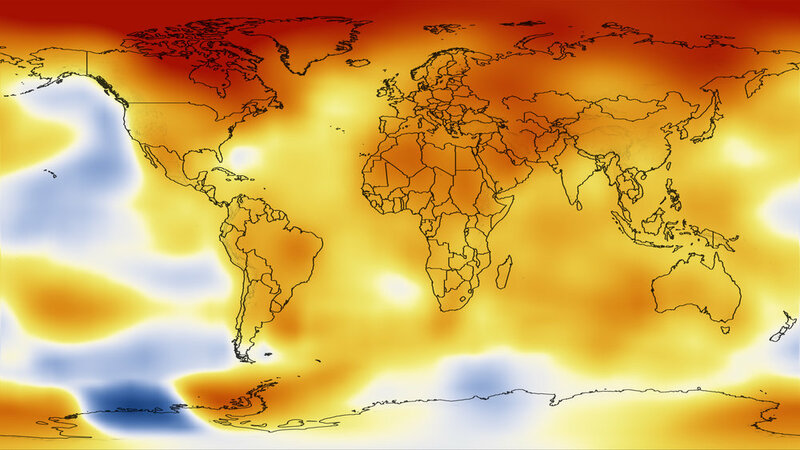 NASA computer image of a scenario for future climate change. Climate change is probably the most difficult collective action problem in human history. My papers explain why. They also provide insights into how we could do better. “Choices in the Climate Commons,” Science 362(6420): 1217. With Astrid Dannenberg, “An Experimental Investigation into ‘Pledge and Review’ in Climate Negotiations,” Climatic Change138(1): 339-352, 2016.
with Juan Moreno-Cruz, “The Alternatives to Unconstrained Climate Change: Emission Reductions versus Carbon and Solar Geoengineering,” in S. Barrett, C. Carraro, and J. de Melo (eds. ), Towards a Workable and Effective Climate Regime, VoxEU.org eBook, CEPR and FERDI, 2016, pp. 353-365, 2016. "Solar Geoengineering’s Brave New World: Thoughts on the Governance of An Unprecedented Technology," Review of Environmental Economics and Policy, 8(2): 249-269, 2014.
with Timothy M. Lenton, Antony Millner, Alessandro Tavoni, Stephen Carpenter, John M. Anderies, F. Stuart Chapin III, Anne-Sophie Crépin, Gretchen Daily, Paul Ehrlich, Carl Folke, Victor Galaz, Terry Hughes, Nils Kautsky, Eric F. Lambin, Rosamond Naylor, Karine Nyborg, Stephen Polasky, Marten Scheffer, James Wilen, Anastasios Xepapadeas, and Aart de Zeeuw, "Climate Engineering Reconsidered," Nature Climate Change, 4: 527-529, 2014. “Negotiating to Avoid 'Dangerous' Climate Change,“ in Nicholas Stern, Alex Bowen, and John Whalley (eds. ), Development of Policy Regimes to Combat Climate Change, London: World Scientific, pp. 159-180, 2014.
with Astrid Dannenberg, “Sensitivity of Collective Action to Uncertainty about Climate Tipping Points,“ Nature Climate Change, 4: 36-39, 2014.
with Astrid Danneberg, “Negotiating to Avoid 'Gradual' versus 'Dangerous' Climate Change: An Experimental Test of Two Prisoners‘ Dilemmas,“ in Todd Cherry, Jon Hovi, and David M. McEvoy (eds. ), Towards a New Climate Agreement: Conflict, Resolution, and Governance, London: Routledge, 2014. Why Have Climate Negotiations Proved So Disappointing?“ Sustainable Humanity, Sustainable Nature: Our Responsibility, Pontifical Academy of Sciences, Extra Series 41, Vatican City 2014; available at http://www.pass.va/content/scienzesociali/en/publications/acta/sustainable.html. “Climate Treaties and Approaching Catastrophes,“ Journal of Environmental Economics and Management, 66(2): 235-250, 2013.
with Astrid Dannenberg, “Climate Negotiations Under Scientific Uncertainty,“ Proceedings of the National Academy of Sciences, 109(43): 17372-17376, 2012. “A Primer on the Economics of Solar Radiation Management,“ in IPCC, 2012: Meeting Report of the Intergovernmental Panel on Climate Change Expert Meeting on Geoengineering [O. Edenhofer, R. Pichs-Madruga, Y. Sokona, C. Field, V. Barros, T.F. Stocker, Q. Dahe, J. Minx, K. Mach, G.-K. Plattner, S. Schlömer, G. Hansen, M. Mastrandrea (eds.)]. IPCC Working Group III Technical Support Unit, Potsdam Institute for Climate Impact Research, Potsdam, Germany, pp. 33-34. “Climate Treaties and Backstop Technologies,“ CESifo Economic Studies, 58(1): 31-48, 2012. “Credible Commitments, Focal Points, and Tipping: The Strategy of Climate Treaty Design,“ in R.W. Hahn and A. Ulph (eds. ), Climate Change and Common Sense: Essays in Honour of Tom Schelling, Oxford: Oxford University Press, 2012. “Avoiding Disastrous Climate Change is Possible but Not Inevitable,” Proceedings of the National Academy of Sciences108(29): 11733-11734, 2011. “A Portfolio System of Climate Treaties,“ in J.E. Aldy and R.N. Stavins (eds. ), Post-Kyoto International Climate Policy: Implementing Architectures for Agreement. Cambridge: Cambridge University Press, pp. 240-270., 2010.
with Michael Toman, “Contrasting Future Paths for an Evolving Climate Regime,“ Global Policy1(1): 64-74, 2010. “The Coming Global Climate-Technology Revolution,“ Journal of Economic Perspectives, 23(2): 53-75. 2009. “Rethinking Global Climate Change Governance,“ Economics: The Open-Access, Open-Assessment E-Journal, Vol. 3, 2009-5. http://www.economics-ejournal.org/economics/journalarticles/2009-5. “Climate Treaties and the Imperative of Enforcement,“ Oxford Review of Economic Policy, 24(2): 239-258, 2008. Reprinted in A. Kellow and S. Boehmer-Christiansen (eds. ), The International Politics of Climate Change, Cheltenham, UK: Edward Elgar, 2010. “The Incredible Economics of Geoengineering,“ Environmental and Resource Economics, 39: 45-54, 2008. “A Multi-Track Climate Treaty System,“in Joseph E. Aldy and Robert N. Stavins (eds. ), Architectures for Agreement: Addressing Global Climate Change in the Post-Kyoto World, Cambridge: Cambridge University Press, 2007. “Climate Change Negotiations: Past and Future,” in D. Helm (ed. ), The New Energy Paradigm, Oxford: Oxford Univeristy Press, 2007, pp. 422-437. “Climate Treaties and ‘Breakthrough’ Technologies.” American Economic Review(Papers and Proceedings), 96(2): 22-25, 2006. Reprinted in Michael Finus and Alejandro Caparros (eds. ), Game Theory and International Envionmental Cooperation, Cheltenham UK: Edward Elgar, forthcoming. “Kyoto Plus,” in D. Helm (ed. ), Climate Change Policy, Oxford: Oxford University Press, 2005. \with Joseph Aldy and Robert Stavins, “Thirteen Plus One: A Comparison of Global Climate Policy Architectures,” Climate Policy, 3(4): 373-397, 2003.
with Robert Stavins, “Increasing Participation and Compliance in International Climate Change Agreements,” International Environmental Agreements: Politics, Law, and Economics,3(4): 349-376, 2003. “Towards a Better Climate Treaty,” World Economics, 3(2): 35-45, April-June 2002; appeared previously in AEI-Brookings Joint Center for Regulatory Studies, Policy Matters01-29, November 2001; translated in Italian and appeared in La Questione Agraria. “The Crucial Role of Economic Incentives and Enforcement,” in R.J. Kopp and J.B. Thatcher (eds. ), The Weathervane Guide to Climate Policy, Washington, DC: Resources for the Future, pp. 42-47, 2000. “Political Economy of the Kyoto Protocol,” Oxford Review of Economic Policy, 14: 20-39, 1998. Reprinted in D. Helm (ed. ), Environmental Policy: Objectives, Instruments, and Implementation, Oxford: Oxford University Press, 2000, pp. 111-141; reprinted in M. Toman and B. Sohngen, eds., Climate Change, Aldershot, UK: Ashgate, 2004; reprinted in A. Kellow and S. Boehmer-Christiansen (eds. ), The International Politics of Climate Change, Cheltenham, UK: Edward Elgar, 2010.
with B. Fisher, P. Bohm, J.K.E. Mubazi, A. Shah and R.N. Stavins, "An Economic Assessment of Policy Instruments for Combatting Climate Change," in J.P. Bruce, H. Lee, and E.F. Haites (eds. ), Climate Change 1995: Economic and Social Dimensions of Climate Change, Cambridge: Cambridge University Press, 1996, pp. 397-439. "European Carbon Tax," in A.R. Beckenstein, F.J. Long, M.B. Arnold and T.N. Gladwin (eds. ), Stakeholder Negotiations: Exercises in Sustainable Development, Chicago: Irwin, 1996, pp. 69-91; see also teaching note in the accompanying Instructor's Manual, pp. 85-91. "Reaching a CO2Emission Limitation Agreement for the Community: Implications for Equity and Cost-Effectiveness," European Economy, Special Edition No. 1, 1992, pp. 3-24. "'Acceptable' Allocations of Tradeable Carbon Emission Entitlements in a Global Warming Treaty," in UNCTAD (ed. ), Combating Global Warming: Study on a Global System of Tradeable Carbon Emission Entitlements, New York: United Nations, 1992, pp. 85-113. "Transfers and the Gains from Trading Carbon Emission Entitlements in a Global Warming Treaty," in UNCTAD (ed. ), Combating Global Warming: Study on a Global System of Tradeable Carbon Emission Entitlements, New York: United Nations, 1992, pp. 115-125. "Economic Instruments for Climate Change Policy," in OECD, Responding to Climate Change: Selected Economic Issues, Paris: OECD, 1991. "Economic Analysis of International Environmental Agreements: Lessons for a Global Warming Treaty," in OECD, Responding to Climate Change: Selected Economic Issues, Paris: OECD, 1991. "Global Warming: Economics of a Carbon Tax," in D. Pearce (ed. ), Blueprint 2: Greening of the World Economy, London: Earthscan, 1991. "The Economic and Environmental Consequences of a Carbon Tax," Economic Outlook, February 1990.